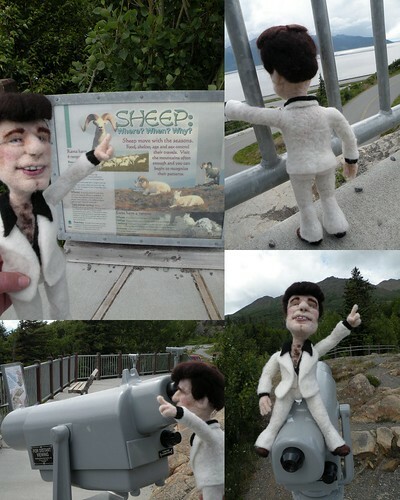 Li'l Travolta Sightseeing in Alaska, originally uploaded by feltalive. I had to make a Li'l Travolta Saturday Night Fever style! Boy does that take me back. I have to find a place with a disco ball for his official photo shoot but in the meantime we took him out sightseeing here in Alaska. When we stopped in at McHugh Creek along Turnagain Arm he learned an awful lot about the Dall Sheep we spotted in the moutains...Hmm....I wonder why he was so fascinated??? ?